Another pass has been made to Mistweavers and I still have a lot of feedback to give! So I’m just gonna softball this feedback post to the developers and hope I can contribute with some constructive discussion. I tried to be short and concise, but hah, I don’t have the talent for it. Quick note – the TFT-Enveloping buff has a new instant heal component added on beta, which you still benefit from if you TFT-Enveloping during Soothing Mist. While this loses part of the value of the buff, it’s still a reasonable option to provide for when an instant heal seems important. All that said, one concern with the current setup on beta is that TFT-Renewing might dominate the other uses of TFT too often. Some of the exact bonuses it provides may have to be adjusted once everything else settles. Not everyone has been granted beta access to Bfa, yet, so there are many questions regarding the new capitals – Where are they? How big are they? How do they look? 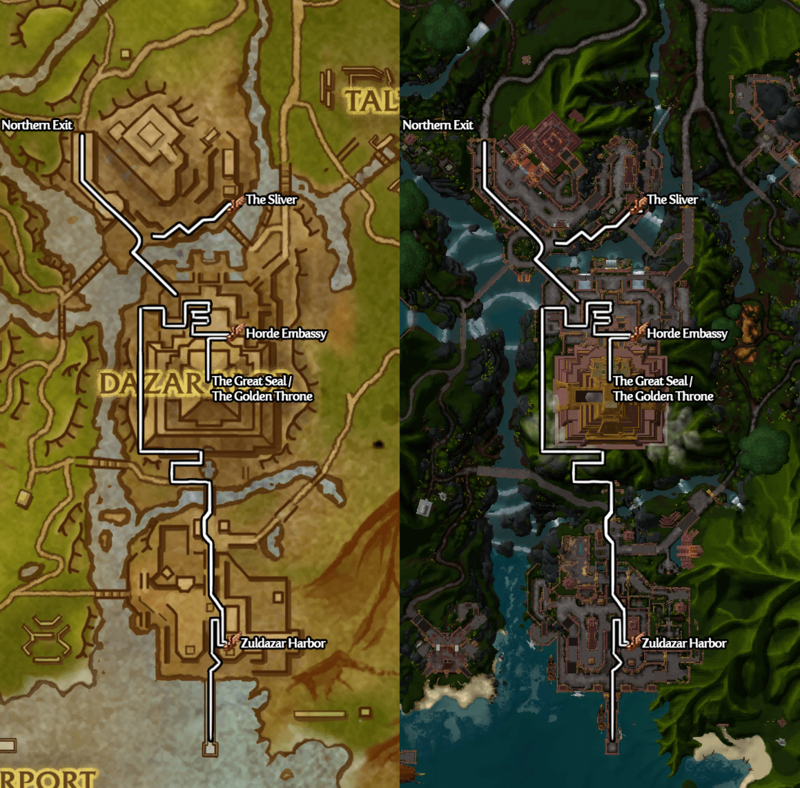 For those who still wonder about this, let me guide you around our new homes for Battle for Azeroth. There’s the Horde capital Dazar’Alor, together with the Alliance capital Boralus. Enjoy! Dazar’Alor is located within the jungles of Zuldazar on the Zandalar continent (confusing, I know). The area is comprised of two big pyramids together with a large harbor. There are some questing areas within the capital itself, so don’t be surprised if you run into enemies if you take a wrong turn. There has been some official follow-up on the issue of Renewing Mist by the developers. Namely, a fix for the very common problem of overwriting them little buggers. I am currently drinking herbal mint tea in celebration and am in the mood for some tea talk. Thanks for all the followup on Renewing Mist. In an upcoming beta build, we’re likely going to try having Renewing Mist automatically try to jump, if you cast a new one that would overwrite it. Why thank you, oh glorious Sigma. Now we can stop competing with our active Renewing Mists for competitive targets, and not to mention, being able to shamelessly cast it on players who actually need our mastery heal as well! I love the smell of victory in the morning. While I still think mistweavers could use some polish on beta, that was really my biggest issue and I’m incredibly happy that they are planning to fix it. Now I can finally relax and nag about smaller details. As it should be! I have been on the alpha (build 26476) and tried the new mistweaver changes. I hope I’m catching the blizzard developers in one of their class-changing cycles right now, because there’s a lot of feedback I want to give – both good and bad! Here’s hoping that a developer sees this. I’ve tried to be clear and succinct in my feedback, but I’m still me so it’s longer than I planned. Oh, well! Overall, I’m positive about the changes and I think we’re going in the right direction for Mistweavers. So far, I’ve haven’t had the opportunity to raid heal on the alpha, but I’ve done plenty of dungeon healing, so my focus will probably be skewed in that direction in this post. I will go through both positive changes and some of the things I want improved.